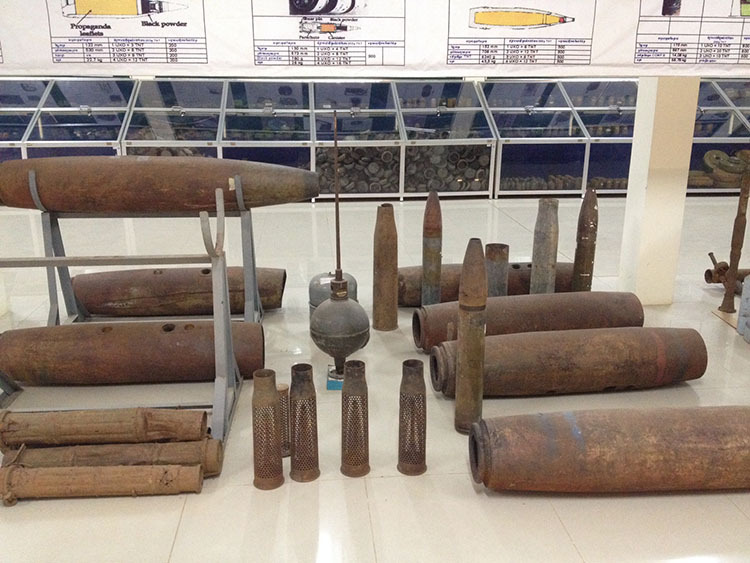 The grand entrance of the CMAC headquarters in Phnom Penh is flanked by a couple of large decommissioned bombs. It delivers you into a cream walled, empty, high ceilinged lobby featuring an enormous poster depicting a green countryside scene of demining activities. On my introductory visit, I was shown round the large exhibition room by the public relations officer. While showing me a map of the country, much of it covered in red dots showing the danger zones, he talked about his own past. Like so many Cambodian men, he was forced to carry weapons and ammunition around for the Khmer Rouge. Nevertheless, his stories were punctuated by bursts of laughter. 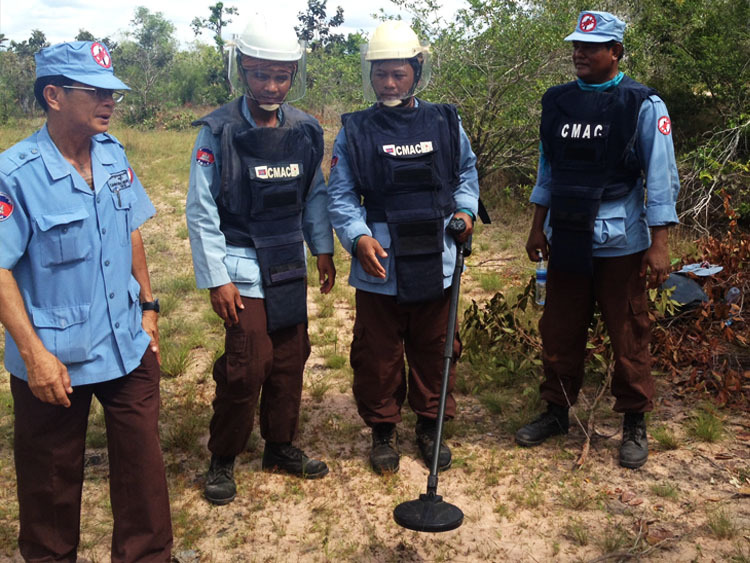 The Cambodian Mine Action Centre (CMAC) is the Cambodian government agency responsible for demining activities. It receives funding from Australia, the Netherlands, Belgium, Canada, the EU, France, Germany, Japan, New Zealand, Switzerland, the UK and the USA. It is also supported by a slew of agencies such as Handicap International, Care International, the UNDP and UNMAS. 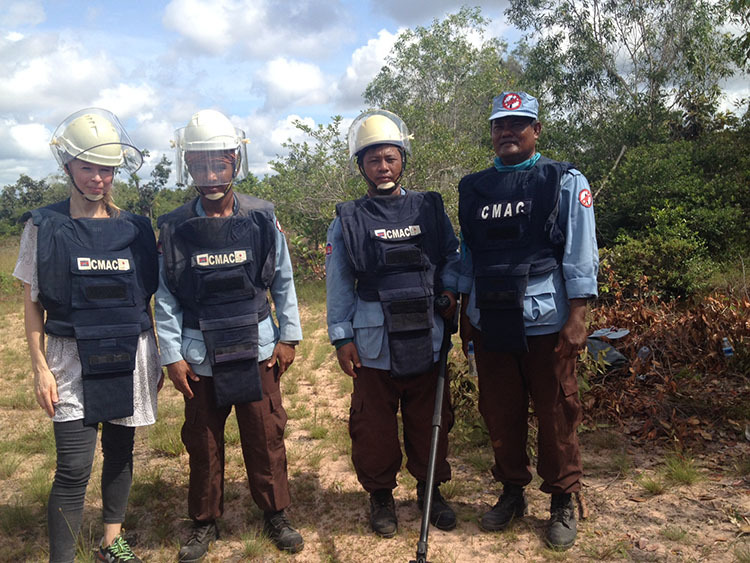 Since 1992 they have cleared 570 million square meters of land, and found and destroyed 500 000 landmines. I wanted to see first hand where the metal that our artisans use was coming from. I wanted to know about the safety issues, and I wanted to meet the people that do this work. Besides, as a designer, I want to connect with the material that I design with. So I asked if I could visit a team at work in a mine field. 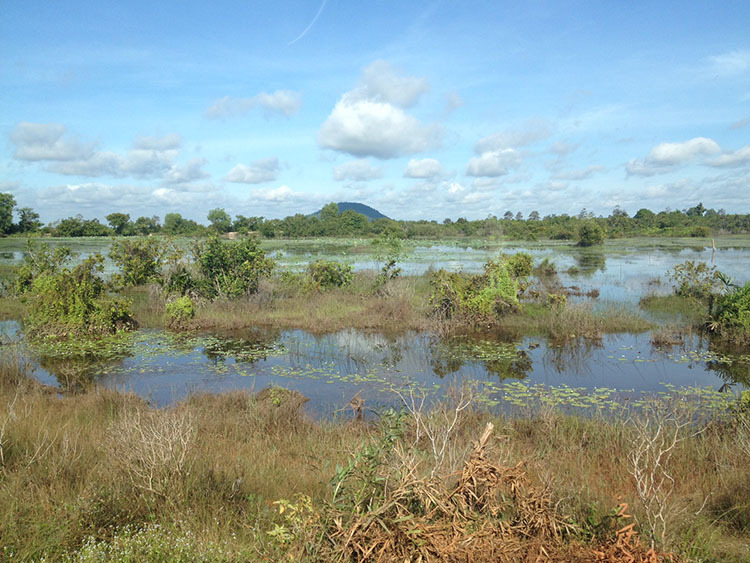 Upon receiving approval, I was told to report to CMAC Unit 4 just outside of Siem Reap. Entering a clean lobby I heard someone on the phone behind an ajar door and waited. Somehow the DU manager, Saem Punrey, inside knew it was me, came out immediately, and upon shaking my hand managed to say, “I… am happy…you come here!” with sincere warmth and effort. He quickly summoned other staff. I was again shown around an exhibition room by the friendly deputy manager Kong Him Chuon who spoke some very basic English. There was some discussion among the manager and the deputy. Eventually they decided that the best thing was for them to pick me up from my hotel in their car the next morning at 7am. After sweating it out in tuktuks during the length of my stay in Cambodia, it was rather ironic to be escorted in the luxury of an air conditioned car on this particular occasion. 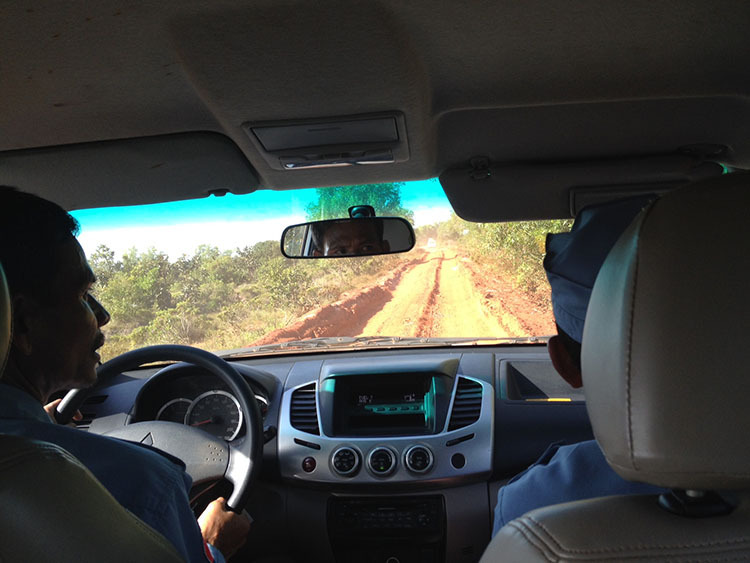 But after about an hour on a paved road we turned into a very muddy and deeply grooved red dirt track. We then had to walk the rest of the 100 m to the field unit centre: a small round house next to a very basic family hut. 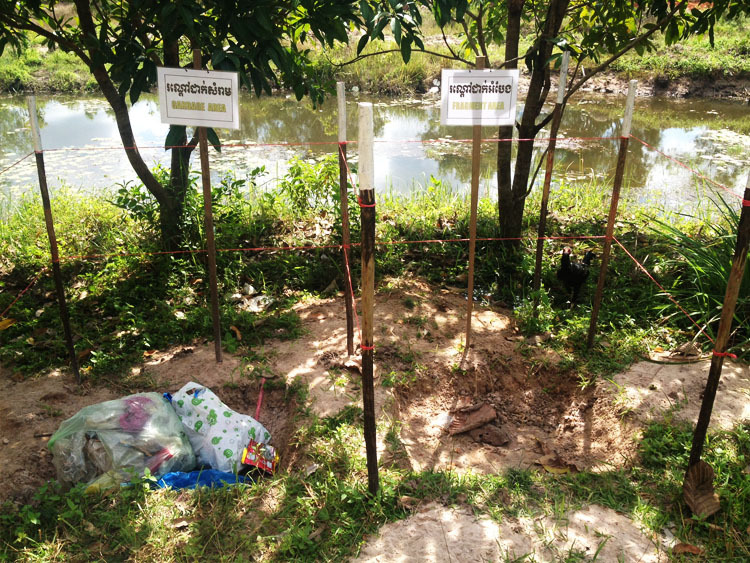 There was a hand water pump where a little girl was washing dishes, with chickens running amok around two neat rubbish pits marked “garbage area” and “fragment area”. 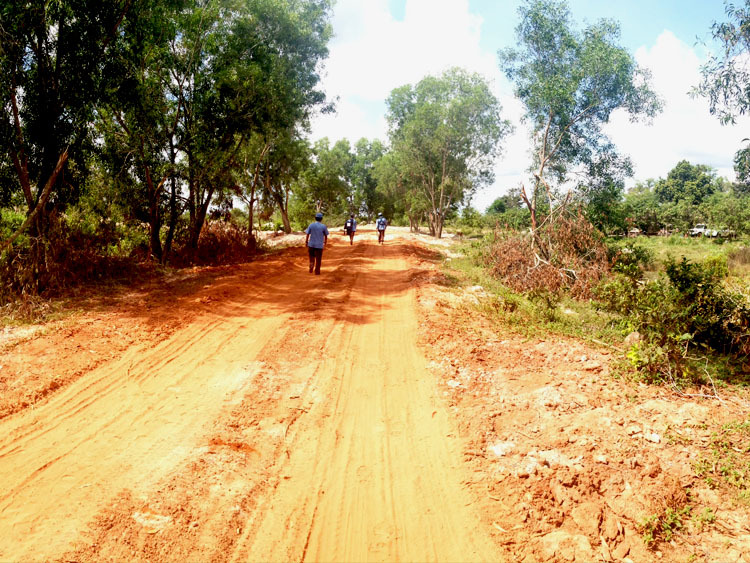 An official briefing was given in Khmer by team leader Om Chan Rom, roughly translated by Chuon, the deputy, to make sure I understood the procedure of the clearing, the meaning of the various coloured markers and signs, and all safety precautions. Om Chan Rom leads a team of 5 to clear area BS.CMAA.04066.A4. It is a total area of 17 hectares that will take them 6 months to clear. “They are Russian mines, these,” explained Chuon. 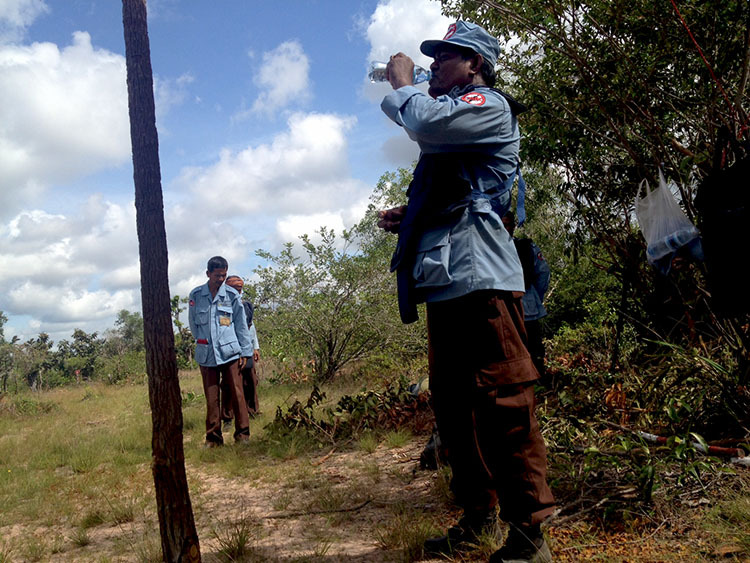 The Russians of course having been on the side of the Khmer Rouge, who caused extensive deforestation in western Cambodia, chopping down anything that might offer a chance for the enemy to hide, and laying mines to keep everyone away. Mines in fact were laid by their conscripts who were adults and children alike. 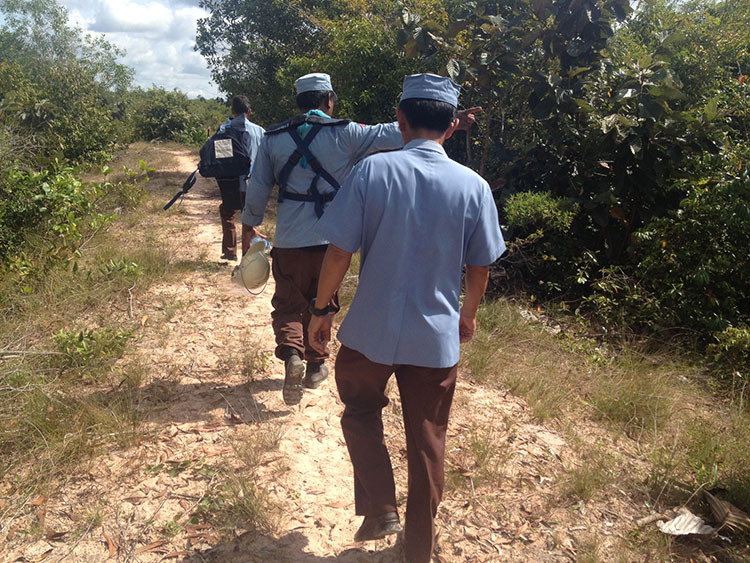 Extensive location research is conducted by all demining agencies, and the most effective method is to collect information from villagers who remember where they had laid the mines. We set off on a 600m long walk over a tree lined red dirt road, which turned into a white sand track through a more barren landscape, under the blazing morning sun, with nothing but shrubs on either side. It wasn’t until I saw the first red sign with white skull and crossbones, that it hit me. This was a tall one, meaning: it is somewhere here. My sheltered tourist life so far had kept me in safe towns and on busy roads, but this was another, secretive and dangerous land altogether. Following the officers closely, I crossed a dry gully, and then spotted three men in safety vests and white helmets crouched by red tape that sectioned off the suspect area. Om Chan Rom came towards me with the safety vest and the helmet. The helmet was strapped tightly on the inside around my head. He motioned for me to follow him and we set off towards one of the red skull and cross bones signs seen just by the red tape. This was a short one, meaning: here it is. Cocooned behind the vizor, my breathing inside the vizor was the only sound I could hear besides the soft crunch of soil under my feet. One of the men was cutting away shrubs nearby just inside the taped area. He then moved the first of two red yard sticks up away from the tape, about 50cm. Then his colleague went over the area between the two sticks with a metal detector. After only small reassuring blips were heard, the second red yard stick was then moved up to where the first one was. Done. Each step I took to the left or right behind the working officer, Om Chan Rom behind me moved with me to make sure I was not going to step anywhere I wasn’t supposed to. I had to stop filming for a moment in wonder. Eye witness. Dangerous. Respect. It’s so damn hot. And these guys are here all day. Moving sticks up. What would they be thinking of all day and still focus? No sooner had I witnessed how it was done, and Om Chan Rom motioned for me to go back to the others. Water was handed out. Pictures were taken. Definitely one of those situations where you wish there was no language barrier. “Thank you” just doesn’t quite cut it. Thank you for all you do. Keep up the good work. God bless you and keep you safe.